These two hand-held portable recorders share many common features to record stereo audio to SD or SDHC media in MP3 or WAV format. Both offer professional features such as 48V phantom powering, XLR microphone connectors and resolution up to 96kHz and 24-bit recording depth. The PMD-661MKIII offers encription facilities and in addition to the inbuilt stereo microphones is supplied with a external boundary microphone. Although designed for use in journalism, sound effect capture, and broadcast, the PMD561 is suitable for a list of other audio capture uses. This solid state recorder has many of the same features as the PMD661mkIII, however, it doesn't feature an encryption facility. The PMD561 can capture audio with its inbuilt stereo condenser microphone array or by utilising switchable balanced/unbalanced inputs, 3.5mm-jack line-input or digital S/PDIF input to capture externally sourced audio. Global phantom power can be switched from the top panel to provide +48V to microphones connected to the balanced XLR inputs. The audio is recorded to either a SD or SDHC flash memory card in either WAV or MP3 formats with a recording resolution up to 96kHz and optional 16 or 24-bit recording depths. Up to 7 hours usage can be achieved using 4x AA batteries or the included AC power supply can be used for constant usability. A 'Retake' function gives the user 'a simple button press' to enable a preview of previously recorded audio and create a 'drop-in point' to overdub. Passcode protection can be set for the device access. However, there is no file encryption protection on this model as there is on the PMD661mkIII. The PMD561 recorder can be used handheld, placed on a flat surface or stand-mounted. When placed on a flat surface, the facing side has two XLR/jack combination input connectors. The right side offers the power switch, key lock, 3.5mm jack input (line in 2), dual RCA unbalanced line outputs, and a rotary-control with balance control inset for record-level. The left side has the SD card input, DC input connector, USB connector, and digital S/PDIF input. The left and right sides also have grilles to protect the inbuilt speakers. The forward facing side has a 6.3mm headphone output with output volume control, a connection to link an optional remote control, the phantom power on/off/line switch, and two grilles protecting the internal condenser microphone array. The top of the unit has a well-defined OLED display, a ten-stage, LED bar-graph level meter, with recording indicator and overload indication, menu function keys and transport buttons. SD or SDHC flash memory cards with maximum capacity of 64GB. MP3: MPEG1 Layer III compression; 320/256/192/128/64/32 kbps. WAV: 16/24 bit linear PCM. 44.1/48/96kHz sampling. Inputs: 1.2mV RMS, 4.2kohms, microphone; 0dBu, 4.2kohms, balanced line; 500mV RMS, 20kohms, unbalanced line. Response: 20Hz-24kHz (+1dB). Noise: 65dB (Mic), 85dB (Line), IEC A-weighted. Distortion: 0.08 (Mic), 0.02 (Line) percent THD at 0VU. Dynamic range: 85dB. Outputs: 2V RMS, 10kohms, line; 16mW, 32 ohms headphones. Phantom power: 48V, 10mA maximum. Power source: Four AA cells which give approx. 7 hours use, or the included power adapter. Dimensions: 170 x 105 x 40 (h x w x d)mm. Weight: 353g without batteries. 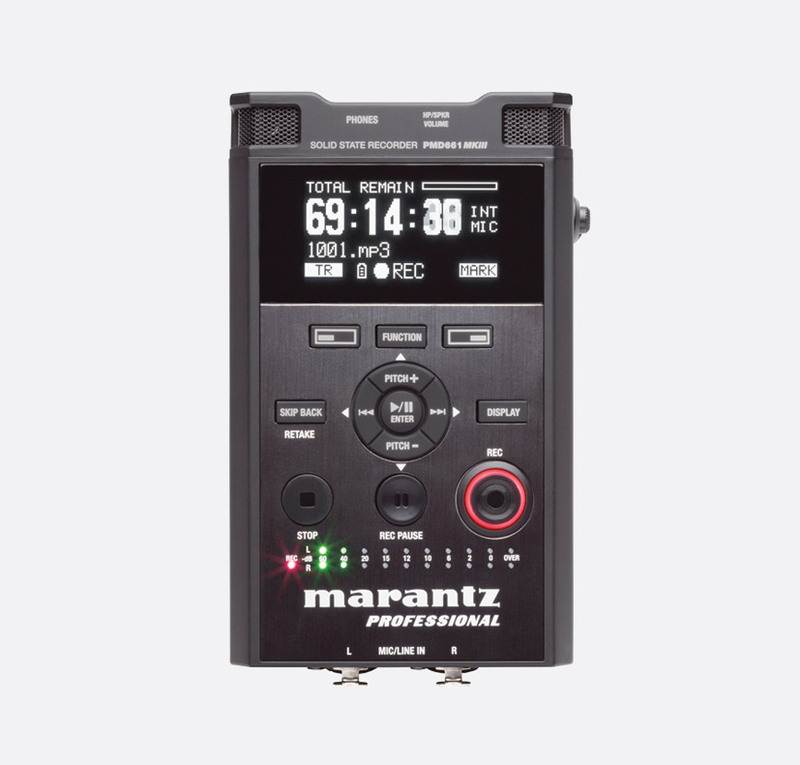 Designed for use in journalism, courts of law, investigation, research, and broadcast, the Marantz PMD661-MKIII follows in the footsteps of its mark two predecessor, with many of the features and functions of the updated version designed to give familiarity and improvement. In the same way as the Marantz PMD661 and PMD661mkII, the mkII version records stereo audio from the integrated condenser microphone or external audio sources using the switchable balanced/unbalanced inputs, 3.5mm jack line-input or digital S/PDIF input. Additionally, the PMD661-mkIII is supplied with an external, omni-directional, boundary microphone that is connected using the included XLR to mini-XLR cable. 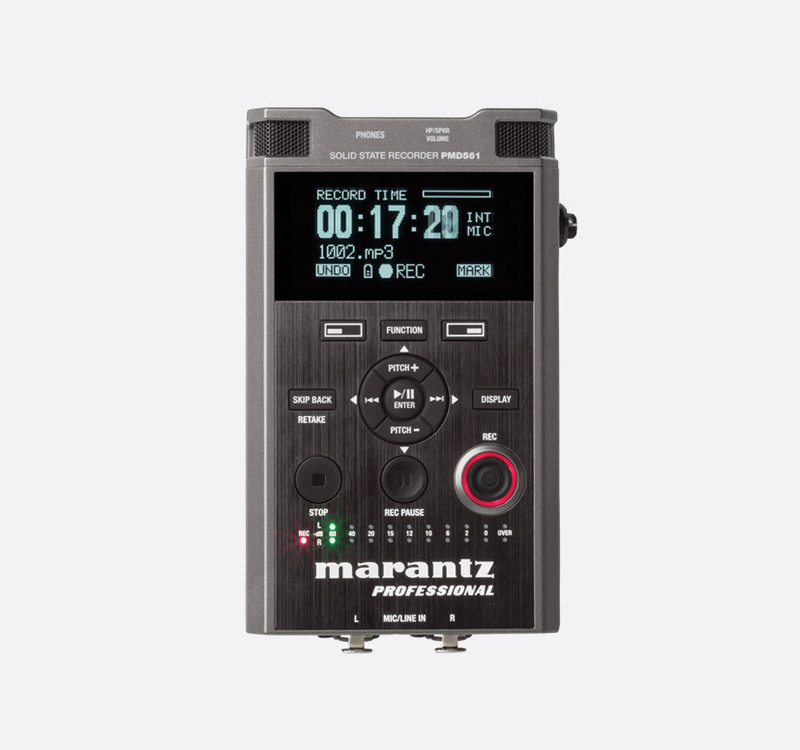 48V phantom power is provided via the two balanced XLR inputs and is globally switched using the on/off/line switch on the top of the recorder. The audio is recorded to either a SD or SDHC flash memory card in either WAV or MP3 formats with a recording resolution up to 96kHz. 24-bit. Up to 7 hours usage can be achieved using 4x AA alkaline or Ni-MH batteries. The linear style 'Retake' function of the PMD661mkII has been retained, giving the user 'a simple button press' to enable a preview of previously recorded audio and create a 'drop-in point' to overdub. Passcode protection and file-encryption work together to safeguard recordings with a 4-digit passcode. MP3 files are encrypted as MPS files, and WAV files are encrypted to WAS files. The recorder can be used placed on a flat surface, stand-mounted, or enclosed in the included carrying case. When placed on a flat surface, the facing side presents two XLR/jack combination input connectors. The right side offers the power switch, key lock, 3.5mm jack input (line-in 2), dual RCA unbalanced line outputs and a rotary record level-control with balance control inset. The left side has SD card input hatch, DC input connector and digital S/PDIF input. Both left and right sides also have grilles to protect the inbuilt speakers that automatically mute when recording with internal microphones. The forward facing side has a 6.3mm headphone output with output volume control, a connection to link an optional remote control, the phantom power on/off/line switch, and two grilles protecting the internal condenser microphone array. As well as the large OLED display, the top of the unit has a ten-stage LED bar-graph level meter, with recording indicator and overload indication, as well as menu function keys and transport buttons. SD or SDHC flash memory cards, maximum capacity of 64GB for SDHC. MP3: MPEG1 Layer III compression; Mono, 96/64/32 kbps; Stereo, 320/256/192/128/64 kbps. WAV: Stereo, 16/24 bit linear PCM, 44.1/48/96kHz sampling. Inputs: 1.2mV RMS, 4.2kohms, microphone; 0dBu, 4.2kohms, balanced line; 500mV RMS, 20kohms, unbalanced line. Response: 20Hz-20kHz, 96kHz sampling. Noise: 65dB (Mic), 88dB (Line), IEC A-weighted. Distortion: 0.08 (Mic), 0.02 (Line) percent THD at 0VU. Dynamic range: 85dB. Outputs: 2V RMS, 10kohms, line; 16mW, 32 ohms headphones. Phantom power: 48V, 10mA maximum. Power source: Four AA cells, NiMH or alkaline which give 6 hours use, or the included AC adapter. Lithium internal battery for real-time clock backup. Dimensions : 36 x 93 x 165(hx w x d)mm. Weight: 410g without batteries. Included accessories: Power adapter, SD card, boundary microphone with mini-XLR connector, XLR to mini-XLR cable, RCA to 3.5mm jack audio cable, USB cable, carrying case, quick start guide.